I have heard stories about SOMER Blink for quite some time, as have most people I imagine. They advertise all over the place; from banners on Eve News 24, to pod-casts, and even in PvP videos. Being that I am usually rather cash-poor in Eve, Blink’s micro-lotteries always seemed like the last resort of bored empire bears. I was sure that, like most forms of gambling, the house was going to win at the end of the day. While that might still be the case with Blink, I have an exceptional story to tell. I decided to put 100 million ISK into the SOMER Blink system to get started. For those who are unfamiliar with their process, you literally have to send the isk to a corporation in-game, an act that initially set off my “OMG SCAM” alarms. However, owing to their enormous reputation, I pressed the button anyway. After all, even to me, 100 mil is not really very much isk. 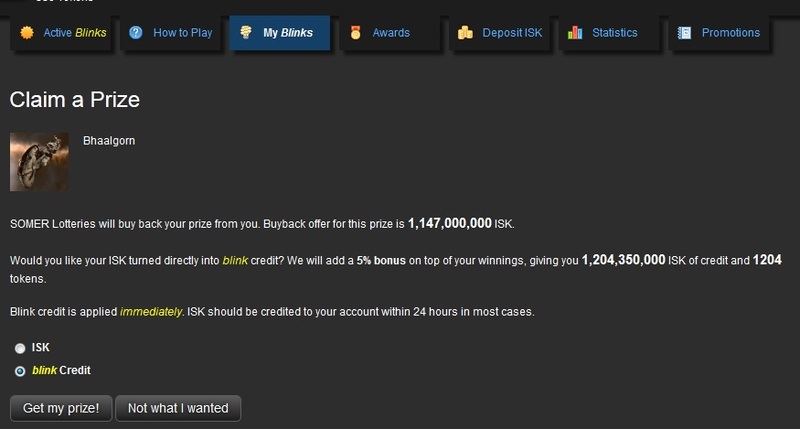 Beyond that, what was the biggest thing that could happen from a 100 million isk bet? As soon as their API updated the website with my in-game donation, I unlocked an “achievement” for buying 100 mil worth of credits. That provided me with an additional ten million isk in virtual currency. I started off by bidding on a few T1 ships, including a Naga and Jaguar. I lost the Naga, but won the Jaguar. Since I didn’t need the ship, I clicked the button to “sell back” the ship for its Jita cost +5% (Blink encourages you to keep gambling by providing a marked-up value). Next I lost on two more low-cost ships, and I was down to about 80 million. I decided to go “all-in” on a Low-Grade Slave Set. To my shock, I won! I could either take 360 mil in-game, or get 380+ mil to keep gambling with. After pondering my options, I decided to keep on gambling. When I lost 4 auctions in a row, I immediately thought I had made a huge error by not running off with my winnings when I had the chance. Then, suddenly, I started winning… winning everything. I won a Legion, Caldari Navy Ballistic Control, Hound, and a Navy Issue Armageddon. Selling those back for 105% – I was now in a position to bid on big items. My big-score finally came: a bhallgorn! Keep in mind – this started with only 100 million isk! I finally cashed out in-game, profiting about 2.1 billion ISK on my 100 million isk investment. It could have been even higher had I not spent so much bidding on a couple other items that I lost, but this was still a huge gain in a short amount of time. The real question now is, how much can I make next time if I put a billion isk into the system? I fully expect that, if I get bold, I will lose my shirt. The problem is, I think I’m addicted now! If you want to get started, you can do so at http://cogdev.net/blink/. Don’t forget to answer the riddles (aka “Butan Trivia”) listed in their in-game channel for free credits. You can also cash-in on extra credits when you buy GTC through their affiliate program with Shattered Crystal.